In a vibrant two-part special for Holy Week, Big Painting Challenge judge Lachlan Goudie packs his easel to undertake a trip of a lifetime. 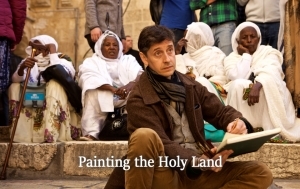 Part travelogue, part spiritual quest, part artistic exploration, this series transports the viewer visually and emotionally as Lachlan challenges himself to capture the look and feel of the Holy Land and the Bible story. Lachlan follows Jesus’s last days on earth the Holy Week events that see him travel from the north of Israel to Jerusalem, and the crucifixion. It’s a pilgrimage that millions undertake, and a story of love and suffering that has inspired some of the world’s most remarkable masterpieces. Lachlan traces the story of Mary through the gospels with a personal question: why is the life of the Mother of God barely described in the Bible, but so well-represented in art? Lachlan looks at her role in the story of the Resurrection and the subsequent events up to Pentecost, fifty days after Easter. ""I wanted to say thank you so much for everything. It was the most wonderful holiday and the memories of which will stay with me a lifetime. It was clear to me that a lot of work went on behind the scenes by both yourself [Liz Drake and Spencer Scott Travel], and Simon [King] to make this holiday the very very best one could wish for and so very special so thank you both so very very much." "
""Just wanted to drop you a quick line to say how very much I enjoyed painting with Pete in Havana. I loved it all, the City, the painting, the company, the Mojito's and the food, and it was great to have Jacqueline there organising us all. Many thanks and I hope to take part again next year.""